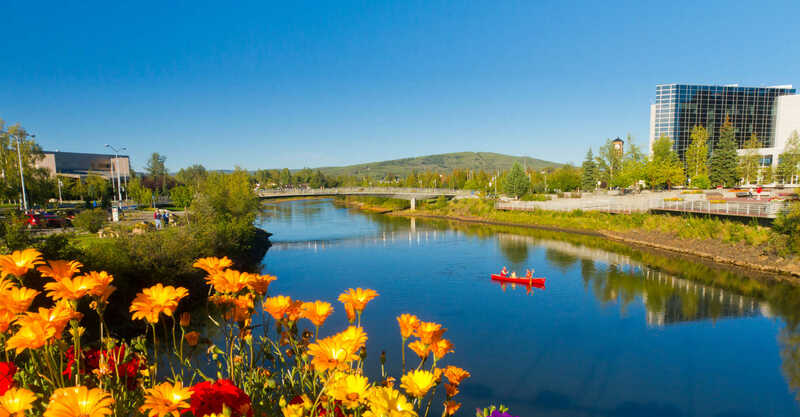 Originally a gold rush boomtown, now known as the “Golden Heart of Alaska,” visitors find Fairbanks inviting, engaging and awe-inspiring—the heart of the last frontier. Take a deep breath and explore Fairbanks! Get lucky panning for gold, float the Chena River, mingle with reindeer and musk oxen, cool off in an ice museum, take a refreshing hike and look for birds and wildlife, visit a dog mushing kennel or be captivated by an array of art galleries, museums, cultural activities and historic sites. After the snow flies Fairbanks offers a host of additional cool things to do and see like skiing, snowmobiling, snowshoeing, curling, hockey, sledding, ice fishing, dog mushing and ice sculpting. Quirky and invigorating, Fairbanks is an outstanding and authentic year-round destination. Fairbanks is Alaska’s second-largest population center, located within the Fairbanks North Star Borough which has a population of nearly 100,000. Centrally located in Alaska’s Interior, Fairbanks is north of Denali National Park and Preserve and south of the Arctic Circle. The 100-mile long Chena River runs through the middle of town and is a focal point for events and activities. The Alaska Highway, Trans-Alaska Pipeline System, military bases, mining and the University of Alaska are all integral to Fairbanks. 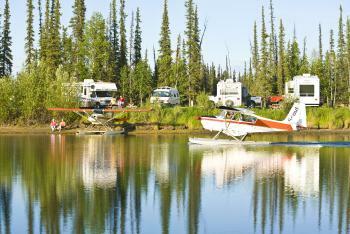 Fairbanks is the ideal basecamp for exploring Alaska’s Interior and Arctic. Denali National Park is two hours away; the Arctic Circle and Yukon River are an accessible five- to six-hour drive; villages without road access, refuges and parks are just a short flight away. The “Adventure Corridor” leads to Valdez and Wrangell-St. Elias National Park. Singular places like Barrow, Nome, Fort Yukon, Beaver, Bettles, Anaktuvuk Pass and Coldfoot are all within reach. Auto rentals, air and ground transportation, guided eco-tours, fishing and boat charters and wildlife tours can be arranged through professional outfitters. Let the warmth and knowledge of local guides help you discover these vast and beautiful lands. Northern Light Ale, Prudhoe Pig Stout, Coldfoot Pilsner and Fairbanks Lager—let the names speak for themselves. “Fairbanks, where the people are unusual and the beer is unusually good” is Silver Gulch’s clever slogan. 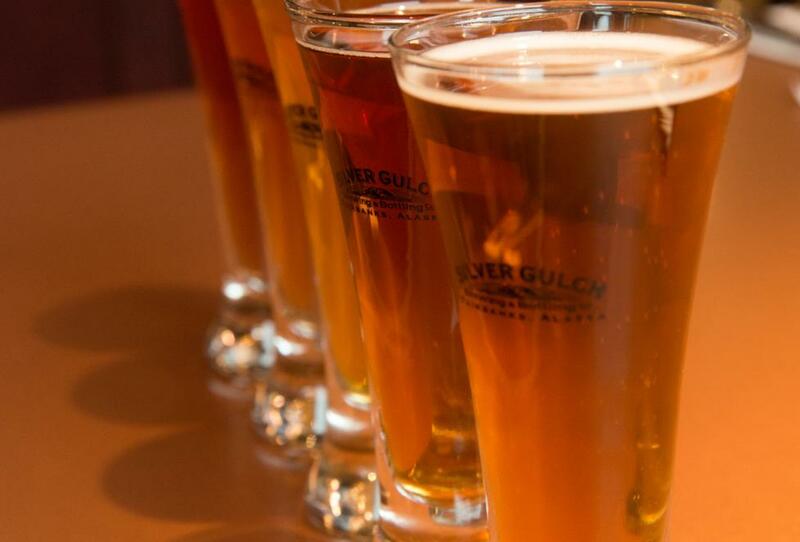 The Silver Gulch Brewing & Bottling Company, housed in an attractive, renovated historic roadhouse, is proud to serve Fairbanks-crafted, world-approved recipes year round. The wildly popular, small-batch, small-town focused HooDoo Brewing Co., named after the Alaskan mountains bearing the same name, takes the phrase “the ART of brewing” totally seriously. The diverse, winning crowd at HooDoo will attest to the painstaking process of brewing craft beer that yields enticing rewards.